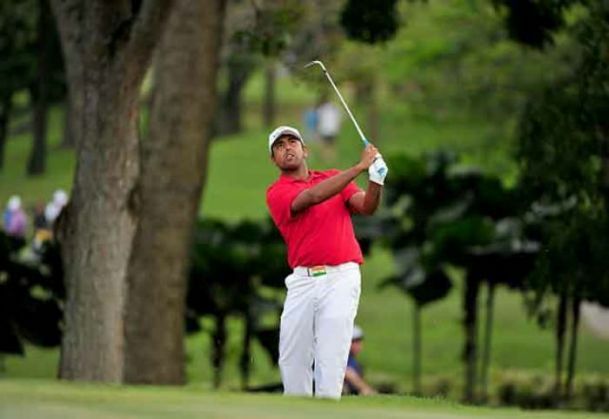 Anirban Lahiri is off to a sensational start in the PGA Tour's Career Builder Challenge in La Quinta, California, after firing eight birdies in a flawless opening round. Two others, Colt Knost and Jamie Lovemark were at 65 and another 11 players shot 66 each. Playing on a sunny morning with very slight wind, Lahiri did not miss a single green on Thursday. Lahiri - a two-time winner on the European Tour last year - got his first birdie on the second and added three more on fourth, sixth and seventh to turn in four-under. A hat-trick of birdies from 11th to 13th brought him to seven- under after which he had just one more on 17th. The World No. 41 said he was happy with his start to the tournament. "I'm really happy with the way I started today. I was a bit unsure of how I was going to go today. Obviously still feeling all the travel from coming from Asia last week. But really happy with the way I hit the ball. I don't think I missed a green all day. I felt really good out there". "This is a good golf course. I think that I like the way this particular golf course sets up. You've got to put it in play off the tee and then you have a lot of opportunities. So, I think it's good, it's good for people to come out and watch, because you see a lot of birdies". Playing his first event on PGA Tour since the Hero World Challenge in Bahamas, Lahiri also spoke about his off-season. "Well, I got a lot of rest, to start. I was playing three different tours last year and I was absolutely ragged by the end of the year. "So I got some rest in (after Hero World Challenge), did some work on the body, got some good gym time in, and spent a couple of weeks with my coach (Vijay Divecha) before I started out last week. So, yeah, I feel ready to go." "Yes, I played the Stadium Course, I went and mapped out the Nicklaus Tournament Course. I got in on Monday afternoon, so I don't think it was a good idea for me to play 54 before I teed up. So we'll find out (about the other courses). They look pretty good. They're similar, if you put yourself in a good position, there's a few wedges and a few birdies to be made. " Among Lahiri's co-lead, Overton had nine birdies and one bogey at the Nicklaus Tournament Course, while Kelly also had a 64 at La Quinta. Dufner shot his 64 at Nicklaus course with eight birdies and no bogeys. Bill Haas, the defending champion carded 66 while Phil Mickelson, two-time winner at Career Builder, shot 68. The 45-year-old Mickelson - in his first start since The Presidents Cup in October - played a seven-hole stretch in 6- under during his 68. He three-putted on par-5 13th and made two late bogeys. Winless since the 2013 British Open, this round was also Mickelson's first since splitting with swing coach Butch Harmon to work with Andrew Getson. The 49-year-old Kelly had two eagles at La Quinta. He missed birdie putts on the final three holes, the first being a 5- footer. READ NEXT >> Cabinet rejig: Will Arun Jaitley lose the Finance ministry?